Since 1998 the Department of Agriculture and Food in conjunction with the Western Australian Vine Improvement Association has imported more than 60 new varieties and clones of wine grape material. These were identified by industry as having domestic and international market potential to enhance the production and development of premium WA wine. Eighteen of these varieties have been evaluated to understand their grape production, winemaking characteristics and suitability to production in Manjimup, Western Australia. Some of the findings are summarised below. The alternative varieties include both red and white varieties of grapes that originated from France, Spain, Italy, Russia, Germany and Hungary. Varieties evaluated include Arneis, Scheurebe, Vermentino, Tannat, Harslevelu, Kadarka, Brachetto, Gamay, Fer, Viognier, Tempranillo, Savagnin Blanc, Lagrein, Barbera, Saperavi, Furmint, Pinot Gris and Durif. These varieties were selected by the wine industry for evaluation due to interest in their growth, fruiting ability, wine production and commercial potential. The trial established a readily available source block of vine material for industry and measured vine growth and development, fruit yield, fruit composition, wine quality and wine sensory analysis. The alternative wine grape evaluation was located at the Manjimup Horticultural Research Institute (MHRI). The trial site was established on a gravel loam soil. The four-year (2007 to 2010) average rainfall for the site was 901.5mm. The mean January temperature at MHRI (2007 to 2010 average) was a minimum of 12.8oC and maximum 26.1oC. The vines received supplementary irrigation based on evaporation rates. All vines (26 vines per variety) were established on their own roots on a VSP trellis with a planting distance of 2m by 3m. Nutrition was applied annually (in spring) based on petiole analysis at flowering. 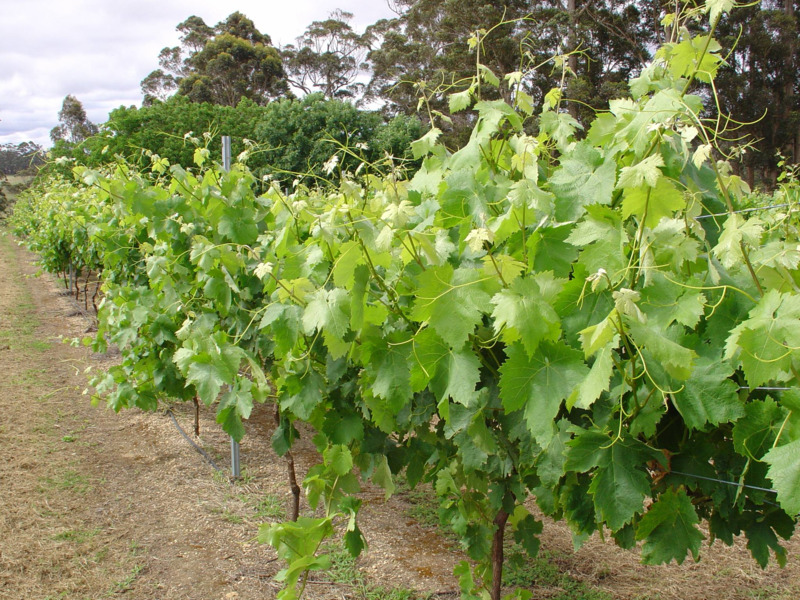 Vines were managed by the spray application of chemicals, where required, for control of powdery mildew, downy mildew, Botrytis and garden weevil. Herbicides for weed control were applied in spring with subsequent inter-row mulching of weeds during the season. All vines were covered with netting after the onset of veraison to protect the grapes from bird damage. All fruit harvesting and pruning operations were conducted by hand. The winemaking approach has focused on producing wines that allow maximum varietal expression and to understand the varieties’ potential for premium wine production. The first year of wine production was 2007 and since then, wine has only been made from those varieties that have produced sound, mature fruit. Timing of grape harvest: examined to determine optimal fruit chemical and sensory parameters suited to the desired style for the variety. Evaluation of the performance of each alternative variety investigated the timing of key growth stages, production characteristics and wine sensory assessment. The timing of key phenology growth stages was investigated and detailed as an average of four growing seasons from 2007 to 2011. Growth stages are indicated by the modified Eichhorn–Lorenz (E-L) system and include budburst (E-L 4), full bloom (E-L 23), veraison (E-L 35) and harvest (E-L 38). The detail of phenology stages has endeavoured to encompass the timing for both early and late seasons. Actual yield per vine, averaged over trial period. For the majority of varieties, bunch thinning was conducted at veraison. Wines produced from this evaluation have undergone a number of sensory assessments. These were conducted by experienced wine judges, winemakers and consumers. In 2009 a panel of 16 winemakers assessed wines from the 2008 and 2009 vintage using the Australian Wine Show Scoring System. This uses a total score of 20 points that includes appearance (maximum 3 points), nose (maximum 7 points) and palate (maximum 10 points). Wines were evaluated at various wine shows including the RSM Bird Cameron Timber Towns Regional Wine Show, Australian Alternative Varieties Wine Show (AAVWS), Geographe Wine Show and the Qantas Wine Show of Western Australia. All wines were judged in experimental classes, excluding the AAVWS where the wines were judged in commercial classes. Varieties that performed well in these events were Barbera, which received a high commendation (equivalent to a gold medal) at the AAVWS, and Saperavi, which received a silver medal score from the winemaker panel and a silver medal at the 2014 Geographe Wine Show. In order to understand consumer perceptions of the alternative variety wines, a consumer survey was performed in 2010. Forty educated wine consumers were asked to score the wine’s colour, aroma, flavour, body, wine style and commercial potential on a 9-point likeability scale. The top performing variety from this assessment was Saperavi, with all categories liked by more than 85 per cent of respondents. Other varieties that also scored highly included Lagrein, Barbera and a late-picked Scheurebe. Other pages provide individual results for many of the varieties that were trialled at Manjimup.